It’s pretty interesting to compare the different space requirements of various urban typologies. 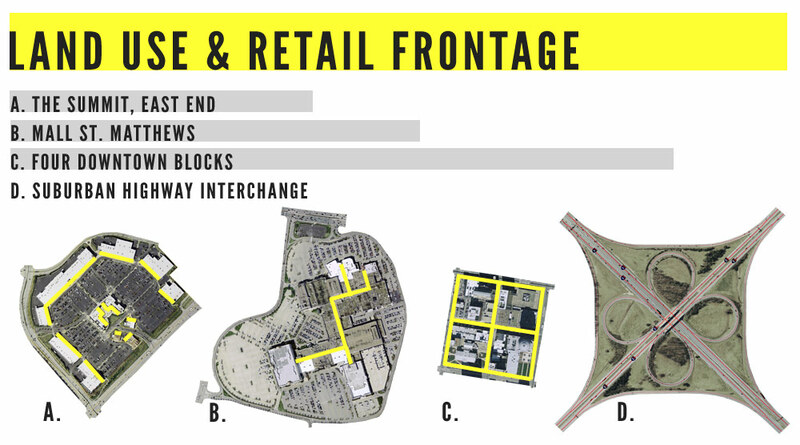 In the example above, the yellow lines represent (potential) retail frontage of different parts of Louisville (examples B and C account for full or partial double-loaded corridors). The linear distance is represented up at the top in gray. (I mentioned “partial” before as it’s unrealistic to assume 100 percent of a city block will be covered in retail space, even though the potential exists that nearly all of it could be.) As you can see, four city blocks take up the lease amount of space while offering the most retail opportunity (and it offers other uses above the ground floor). The others don’t even come close. So you ignore the fact that people need to get to your shops and it’s magically better? That’s silly and absurd. This is an illegitimate comparison. Expand those four city blocks to cover an equal amount of parking and then we might have something. Unfortunately, a four block retail center, however concentrated it may be, doesn’t work for a city like Louisville where we do not have the means to get TO the shops. It’s great for hippies in the Highlands who can walk douw the street, but that’s just not how most of the city works. Imagine a world where your commute to work consisted of just four block intersections completely inundated. Again, the hippies in the Highlands are fine, but those of us working big girl/boy jobs don’t have that luxury and realistically never will. You cannot simultaneously be a mid-sized city with high tech and industry and a 60’s revivalism carless commune in one complete package. Nothing short of New York, which no other city has the booming history to copy can do this. Cinci doesn’t do it, Seattle doesn’t do it, Atlanta sure doesn’t do it. You’re forgetting, Martha, that a downtown block isn’t only a single story like the other examples as I pointed out here, so there’s ample opportunity for a parking garage with retail on the 1st floor to exist in that four block example. Likewise, there’s plenty of room for residences above those shops that would provide patronage for the retail space from people who choose not to commute by car. It’s also completely illegitimate and counterproductive to label people who prefer to walk as hippies. You are right that Louisville has foolishly created an urban pattern where getting around in a car is often the only safe option, but come on, people pay a premium in cities across the country to live in walkable neighborhoods. These people, whether in New York, Seattle, or Cincinnati, have all sorts of grown up jobs. I’m not sure at all what you’re trying to get at by “60s revivalism carless commune.” Now sure where you saw that proposed. The main point here, anyway, is to demonstrate the wastefulness of low-density auto-oriented development versus a higher density city that puts pedestrians first (please note that doesn’t mean banning cars either). Have to agree with Branden on this one! As a real estate agent in Chapel Hill, NC, the hottest development is the condo/lofts built above high-end retail shops, restaurants, etc. Decades ago, the affluent population moved to the suburbs and the poor were stuck in the cities. Over the last 8 – 10 years, the trend has totally reversed and the well-to-do are now paying HUGE $$ to own condos in the downtown area where they can walk to coffee shops and retail stores. We have a quite a few of these neo-traditional neighborhoods with 1200 – 1500 sq. ft. condos…selling for $500,00 + (Meadowmont Village, Greenbridge, East 54, 140 West (under construction), and a lot more in downtown Raleigh. Southern Village near the UNC Campus, has condos above retail shops and my clients walk to the corner grocery store, movie theatre, pizza shop, doctor’s office, bank & bus stop. They love it…. (and none of them are hippies)! @Martha Sam – I live in Old Louisville and bike to my office downtown. I get my bread at Ermin’s which is right around the corner from my house. I get groceries at the corner store which is right down the street and now that the Root Cellar ( http://louisvillerootcellar.com/ ) is at 3rd and Hill I have a great option for farm fresh produce grown locally, within walking distance. Admittedly my favorite coffee shop is in Germantown so I tend to bike but I like the bars in my area (the Rud and the Mag). When something simple in my home needs to be repaired, I walk to the hardware store on 2nd and Oak. It isn’t just the Highlands where walking is possible and no one has ever described me as a hippie. Also, “You cannot simultaneously be a mid-sized city with high tech and industry and a 60′s revivalism carless commune in one complete package. ” Next time you go on vacation, you ought to make it a trip to Portland, OR. @Martha Sam – I live in the Highlands, Ms. Sam. My mother is a teacher, and my father owns a small printing company; both grown up jobs, I think. We are definitely not hippies, so I would appreciate it if you would leave your outdated stereotypes at the door. That being said, I think that your comment does contain a valid point. Outside of the places like the Highlands, Old Louisville, and Crescent Hill, Louisville is a very low-density, unwalkable (does anyone else find it funny that spellcheck doesn’t recognize the word “walkable”?) city. If Louisville is to ever become a truly sustainable, livable city, we have to start seriously encouraging high-density infill development, and connect them with an effective mass transit system. Oh, and don’t build those damn bridges either. I do not live in your area either but I agree with Dottie that shopping “communities” where you can live/shop/entertain and usually is the model being copied all over Ohio – and they are not cheap! I myself live in a “suburb” of Akron (do we really even have suburbs of Akron???) and technically live in a “rural” area. We have to drive around. Most of our city doesn’t even have sidewalks. Whenever we get the chance we love going to these shopping communities and being able to park once and go everywhere we need to – and the kids love it too! Downtown Akron and U of Akron are trying to capitalize on their real estate by doing just such a thing as Branden mentioned. They built retail on their ground floors and have put student housing above. It is great! Interesting graphic. I don’t know that it sells the concept to those who aren’t on board already. You have to address the money aspect through dozens of accompanying charts. Of course, this is a standard not applied to the proven, (bankably) sustainable, and speculative, suburban strip center. Another fun exercise, is measuring (online maps) the distance between intersections/main driveways on Bardstown Road or other ~suburban arterials. Areas that seems to be problematic, like the intersections might be too close together. Only to find, that the separation is equivalent to a downtown Louisville city block. I think that is an accessible illustration of development patterns and choices. I saw another solution to the parking problem being tried at a walkable/bikeable bar on Payne Street today: bike-in customers could buy beers for $1.50. But given that the lot can hold 4 bike-based patrons per car-based patron, it makes a lot of sense to me to offer the discount. And by the way, “bike” here was coopted to mean “motorcycle”, a rare internal combustion variant on the vastly more popular bicycle.